This clearly written parent's guide is full of useful and practical advice for helping your child learn to read and write. It will introduce you to phonics and the different stages of literacy and give you fun ideas for things you can do easily to help develop your child's reading and writing skills. The guide also comes with plenty of online resources below that you can download at home and use again and again! 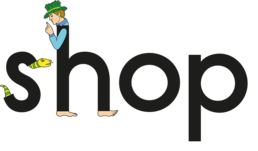 To support your child in pronouncing each letter sound correctly, follow this link to get to our phonics pronunciation guide and click on the character images to hear alphabet sounds and the plain black letters to hear the alphabet names. This pronunciation guide also gives you a valuable strategy for linking all 26 letter shapes to their correct sounds quickly and easily. It's called the Letterland shortcut. All you and your child need to remember is one simple instruction – just START to say ANY Letterland character's name, then STOP. For example: "Sammy Snake, s..." (a steady hissing sound). Below a handy reference with all of the Letterlanders and a guide to saying their names correctly. When children have learned individual letter sounds, they blend – put them together – to form whole words, e.g. 'rrr-u-nnn' _ 'run'. Simple words containing a consonant, a vowel, and another consonant, in that order, e.g. 'pot', 'mat', 'cat', 'cut'. Children typically learn CVC words as the first step in learning to decode (sound out) the letters to turn them into meaningful words. Words a reader can sound out, because he or she has been taught all the phonic facts that occur in those particular words. Two letters together that represent one sound e.g. 'ph', 'ch', 'gh' (consonant digraphs) or 'ai', 'ea', 'oo', 'au' (vowel digraphs). The ability to read a text quickly, accurately, and with proper expression and understanding. The ability to understand the messages in print at various levels, and well enough to read them with expression. Common words that occur most frequently in writing, e.g. and, the, as, it. Children are expected to recognise different high frequency words depending on which year they are in at school. Knowledge of the speech sounds that letters make in words, not their names, so for cat, not 'see' 'ay' 'tee' but the sounds 'c... a... t'. 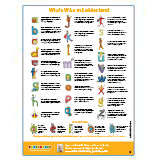 All words that a child can read by just using their first knowledge of the 26 a–z sounds. Breaking a word into its individual letter sounds, e.g. 'cat' _ 'c... a... t'. Words that children learn to recognise at a glance by their overall look, rather than by sounding out each letter. It helps to learn many high frequency words at a glance because they turn up so often in books. As a child becomes a more confident reader, their sight vocabulary will grow naturally of words they instantly recognise. A description of the method of learning to read whereby children learn letter sounds and how to blend these sounds together to make words. Three letters together that represent one unit of sound e.g. 'igh'. Download a list of the 100 most common high-frequency words that includes a helpful key to regular and irregular spelling patterns. It is never too early to introduce your child to books. Babies and toddlers love looking at picture books and hearing you read aloud. You can share books from birth onwards! When is the best time to read with my child? When nothing is competing for their time. If you choose good books and really enjoy them together, so that your child is actually preferring a cosy read with you, you are winning! Should I teach my child the alphabet before they start school? Parents often think teaching the letter names, aee, bee, cee, etc. will give them a head start before school. In fact only 5 letter names (a, e, i, o, u) are ever used in reading! So this is not the best time to emphasise alphabet names. But do get your child interested in letter shapes and their sounds. To make sure you are teaching the sounds correctly, see Shapes and Sounds section of Learn to Read & Write - a Parent's Guide, page 11. My child wants me to read the same book over and over again. Surely we should be reading other things by now? Young children often ask for the same again and again. This can be very frustrating, especially since they seem to have a knack of loving the book you like the least! However, rereading familiar stories gives them confidence and there is obviously something in the book that has captured their imagination. Give them other new book choices and eventually they will move on and find another favourite. My child is a confident reader, but still wants me to read to her books written for younger children. As children grow older and become more independent and skillful, they still like to return to things they remember from younger days - books, toys or television programmes, for example. It might be that reading simpler books gives them happy or secure memories of being younger and more dependent, or that they feel more secure reading a book that they know they won't struggle with. Reading easy books, both to and with them is still useful, but you might want to combine them with longer, more challenging stories where you take turns, with your turns longer than theirs. My child is on a lower level reading book than the rest of the class. Children develop in different ways and at different speeds. Literacy is a complex skill involving many developmental abilities, and children of the same age in the same class will be at completely different stages of literacy development. In addition, a reading scheme may have different sub-levels within a reading level, which will have their own numbering scheme and be difficult to compare. What is more important is whether your child enjoys reading and can talk about the story. If you think your child's reading book needs changing, or you'd like to give more informed help, speak to their class teacher. However, try not to compare levels with other children in the class as reading schemes are not designed to be a race! In the early days of writing your child is unlikely to get every word right. They may also spell purely phonetically e.g. 'froot' for 'fruit' or 'berd' for 'bird'. Encourage and praise them for what they are saying on paper, rather than pointing out wrong spellings. Too much correcting can discourage them and put them off writing. What do I do if my child gets stuck reading a word? In the early stages, just say the word for them, especially if it is a difficult one. For easier words, you may want to give them enough time to try sounding it out before jumping in, or just sound out the irregular part for them. On balance, if there is a risk that their stumbling will destroy their interest in reading, quickly give them the word. Should I correct my child if they make a mistake in their reading? The meaning is the most important part of reading in the early stages, but at first a child may be so busy putting the sounds together to make the words that they can't pay much attention to the story. So rather than interrupting to point out a mistake, try saying, "OK, now let's both read that sentence." Your second reading, done together, restores the story and helps them to hear themselves sounding more fluent. Does it matter if my child writes in capital letters? It is best not to teach writing the capital letters first, except perhaps for the first letter of your child's own name, and of family member names. Since most words in books are lower case, these are the shapes that are more valuable for them to learn to write with before capitals. When they first begin to write squiggles that look like letters, this is your chance to help them make the correct a-z hand-habits from the start. This is important because if they begin with an awkward grip and write letters the wrong way round, these awkward ways can quickly become habits they do not want to change, so it becomes difficult to correct them without upsetting them. My child writes certain letters back to front like b, d, p, q. What should I do? It is very common for children, especially in the early days of learning to write, to get letters the wrong way round. For help see page 13 of Learn to Read & Write - a Parent's Guide‍‍‍‍‍‍. My child is really struggling with reading and writing. Is she dyslexic? Dyslexia is a learning difficulty that mainly affects the skills involved in accurate and fluent word reading and spelling. It is estimated that four to five per cent of the population are dyslexic, and that 375,000 pupils have dyslexia. Just because your child is having difficulties doesn't necessarily mean they have dyslexia. You could look up dyslexia on the internet. If your child seems to fit their typical dyslexic descriptions, the best thing to do first is speak to your child's teacher. My child used to love reading but now she is refusing to read to me. It may be that you child is worried about getting words wrong, or that their tastes in reading are changing, or simply that they are tired. Check if the reading is progressing normally at school. If so, get the teacher to recommend material to read that your child can feel more confident in read, but do carry on reading to him or her, so you are still sharing stories together. You could also encourage them to read other things, e.g. 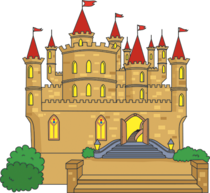 signs, lists, websites, information books, and find enticing books for them to read for themselves, or to younger siblings. My child seems to have stopped making progress in her reading or writing. Take care not to make your child feel as if they are doing something wrong or being lazy. Children develop at different speeds and there are times when they need to be secure in what they know before moving on. Or it may just be that they are taking longer to master a more difficult stage than the one before. Consider checking with their teacher. Meanwhile continue to read stories together, hear them read books at the same level, follow some of the tips in this book and praise and encourage. When they are ready they will progress again. I'm not a very confident reader and my spelling is poor. How can I help my child have confidence in their reading and writing? The most important thing you can do is encourage and praise your child when they read to you or do some writing, and support them in their learning. You could even share with them that you never became a good reader, so they may well be able to teach you some things they learn at school that you didn't know. Some schools or local education centres also run classes to help adults with their literacy skills. Joining one will show your child that learning is good for grown-ups too. My child seems OK with reading but doesn't follow the story very well. Some children seem to read words fluently but have little understanding of the story. Although they may seem fluent, in fact they could be concentrating so much on decoding the words that it is hard for them to focus on the meanings of whole sentences as well. Try focusing on the meaning by asking them to get ready to answer one or two questions you will ask them after they reread a section to you. Then ask questions about what's happening or what they think might happen next. English isn't my first language. Which language should I use to talk to my child about books? Use which ever language you feel most comfortable speaking. It doesn't matter which language you use, you are still talking about books and enjoying them together. If you prefer, read books in your own language as well. You can also get an increasing number of picture books in dual language versions from libraries and bookshops. Letterland uses engaging stories to explain what happens when letters come together to make new sounds in words (digraphs). Your child will quickly discover how easy it is to remember the new sound just by learning the story. Play the videos below which animate five sample stories, then download them to read in your own time and have fun finding the illustrated objects that contain the new sound. You can find the complete set of stories in Beyond ABC and the award winning Far Beyond A‍‍‍BC books. Use the download below to give your child practice in the key skill of blending sounds smoothly together to make seven simple words. Finger tracing is a good way to start practicing the correct writing strokes. This is more effective if your child uses not just one fingertip but two, their first and middle fingers together, to practice the correct writing strokes. Practice finger tracing with these two examples. To make it easier, make the video full screen by clicking on the YouTube icon. Colouring in all the letters of the alphabet helps for learning them. Give your child lots of crayons or coloured pencils and then stick the pages together to make your own alphabet poster! A fun way to develop your child's eye for detail. 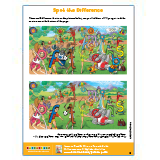 Download the scenes and spot the eight differences between the two images that feature all the Letterlanders. 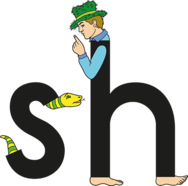 in the design of the two characters, both acting as pointers (like most of the other Letterlanders) in the direction children's eyes must travel to read. Get creative drawing your favourite Letterlanders, then send us your artwork for a chance to be featured on this page. In order to add the little details that turn the plain letters into characters, a child will happily pay close attention to the plain letter shapes, and then have the satisfaction as well of bringing the letter to life! Children enjoy drawing their own versions of the Letterlanders even if their artwork is very simple, and their drawing helps them to take personal possession of the letter shapes. 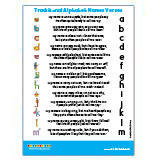 Featuring 7 letters in alphabetical order, this 7 page download allows your child to practice forming all the letter shapes correctly. Bright illustrations help them to link the letter shapes to the alphabet sound. This is a great time to be saying the letter's sound together every time your child writes it. Listen to these catchy songs that makes learning blends and spelling patterns (digraphs) fun and easy to remember. Great to sing, then go over each rhyming text for guided reading or fluency practice. Listen to the complete set of 42 songs on the Blends & Digraphs Songs CD. If you are having trouble listening to the free songs you may need to install Quicktime. Make your own flashcards and start building basic words with your child. 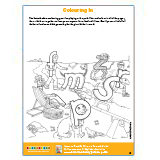 Featuring a selection of pictogram and plain letter cards from First Reading Flashcards for you to print, and cut out. See how many words you and your child can make with only these seven letters: s, m, t, p, a, e, p.
Top tip: stick the Letterland character card to its plain letter to make double-sided cards. Once your child is familiar with all the characters and their sounds, you can test them by using the plain letter side of the card, then flipping it to show them whether they are right. As they get better at this, you can start building words using just the plain letters. First sound out each letter separately. Next blend the first two letters smoothly together, then add the third sound. Finally blend all three sounds together to make a meaningful word. It is this stretching and blending process that your child needs to learn to do well, and this is where you can give regular help. Model for them how to place the sounds on their own arm, and run their hand down it to match what they hear themselves saying. First they put the three separate sounds on their arm, at shoulder, elbow and wrist, as they slowly say each sound. Second they go slowly down to the elbow as they blend the first two sounds before going on down to the wrist for the third sound. Finally they whiz down their whole arm as they speak out the whole (blended) word.